The Hyper Kitchen: "Plague Doctors" or "It Weren't Called the Dark Ages for Nothin"
"Plague Doctors" or "It Weren't Called the Dark Ages for Nothin"
The Black Plague was one of the most lethal diseases that mankind has encountered. Not only was it responsible for the deaths of those it infected, but it also indirectly contributed to terrible famines as those millions who suffered from the plague were unable to work the fields. The total death toll was astonishing. Medicine was woefully primitive and muddied with arcane practices born out of superstition and alchemy. Despite this reliance on crude mysticism, even the doctors could comprehend the danger of the plague and the majority fled for their lives. In their absence, groups of volunteers dedicated themselves to studying the disease, treating the victims as best as they could, and fighting further contamination. They were called Plague Doctors. The beak-faced figure to the left may seem like he crawled out of a nightmare, but his outfit was actually the world's first Hazmat suit. Although the nature of the disease was not understood, the Plague Doctors sought to protect themselves as best as they could. Underneath their heavy black robes, they wore leather aprons, along with boots and gloves of leather. The bizarre bird-like mask was stuffed full of aromatic herbs and spices, in hopes that it would filter out infectious elements (as well as cover the ghastly odor of plague-ridden Europe). The wide-brimmed hat was like a policeman's helmet: alerting others to the Plague Doctor's presence and authority with its distinct design. Frequently they carried canes to prod dead bodies and use as levers to move the cadavers aside. 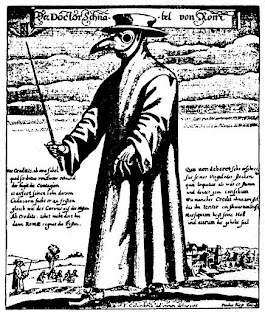 The Plague Doctors were severely ill-equipped to deal with the crisis, but tried to save as many lives as possible, while their own ranks were progressively ravaged by the plague. As that hellish era eventually came to a close, medicine was changed forever in Europe. The arcane procedures of the pre-plague era were cast aside as witchcraft, and a more practical approach was adopted. While this new generation of doctors were only slightly less ignorant of pathology than their predecessors, it was an important step towards the development of medical science. Despite limited effectiveness, the innovation of the Plague Doctor's protective costume was undeniable, and the modern Hazmat suit has its roots in this Dark Age get-up. Labels: Buzz Aldrin, disease, Doktor Beak, doom, germs, hazmat suit, medieval times, science, terrifying bird mask, the Black Plague, what are you a doctor of exactly? Good article... but the second to last sentence ends in a preposition. At least your participles weren't dangling. Very helpful information concerning the extent to which Medicine was affected by the Black Plague. Mindless! Formless! It hungers for human flesh!